I said in yesterday’s post that price and volume charts were not what I look at when I think about Bitcoin. I mentioned Github repos, hackathons, and teams in accelerators working on bitcoin projects. This morning I came across an excellent slideshare on the state of the Bitcoin ecosystem. It had this slide in it. 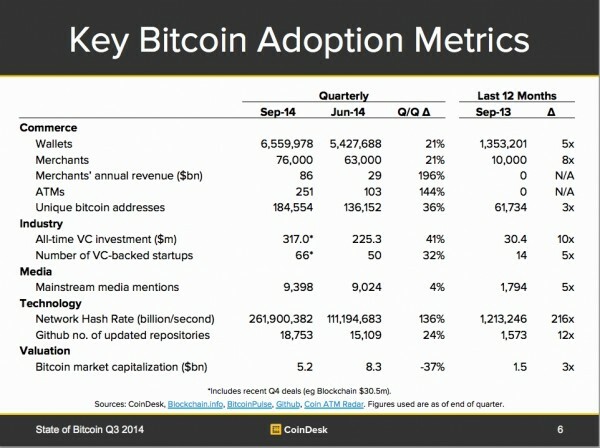 These are the kind of metrics we need to be looking at to decide how Bitcoin is doing. And on these measures, I’d say 2014 has been a great year for Bitcoin. I bumped into a friend of mine last night who said “all you write about is Bitcoin.” That may well be true. But I write about what I think about. So take that for what it is. I’m not going to apologize for my obsession with Bitcoin.